I can't believe it's already Friday. Yesterday was taken up by business tasks and the only workout I got was a short, easy elliptical session. That was actually fine, because I'd covered over 11 miles on Wednesday and I needed to give my legs some rest time. I wanted to get back on track today, so I went out fairly early for a neighborhood run. It was cool and sunny at 7:30 AM, with a breeze that made it feel colder at times. I felt great from the start, and adopted a pace that was neither slow nor aggressive. Hurricane Sandy did a lot of damage to my neighborhood and uprooted many trees that stood for decades in front of homes. Over the last few weeks, the town has rebuilt a number of sidewalks that were torn up by these falling trees. The sidewalks in my neighborhood were already in rough shape due to years of wear. I've always avoided running on the sidewalk because I feared I'd trip on one of the many uneven surfaces. Now that the sidewalks have been repaired, I'm using them more often. I feel much safer when I'm out running, especially during the time when the school buses are on the road. 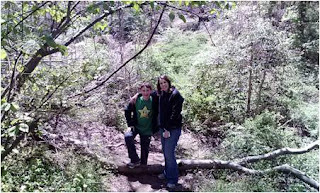 My son did not have classes today, so he, my wife, and I went over to TrailView State Park for a hike. My wife had heard all about our previous adventures and my son was happy to play guide. We took the hiking path north and came back on the longer bike trail. The weather and tree cover kept us cool and comfortable and we covered a couple of miles. 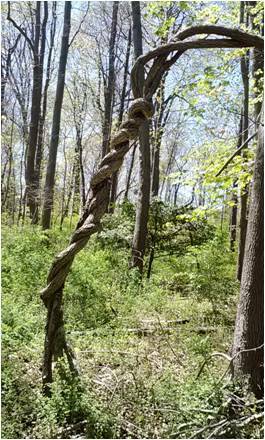 There's always something new to see in the woods, like a tree whose branches wrapped it like a rope (left). It was great to, once again, get two workouts in on the same day. I highly recommend a mid-afternoon hike to break up the work day.